Lapland is located at the northern tip of Scandinavia spanning across Norway, Sweden, Finland and Russia; is an area of outstanding beauty providing activities and experiences for all regardless of age. Father Christmas visits – take a trip to see Santa and his elf helpers in the heart of Lapland forest. You can hand deliver your Christmas wishes and see all the reindeers too. Downhill skiing – there are two main resorts within Finnish Lapland – Yllas and Levi. Each has wide expanses of slopes to allow skiing for all abilities to enjoy. Cross-country skiing – Lapland has an extensive network of cross-country skiing routes throughout the region offering over 300 kilometres of tracks to navigate across. Dotted along the route are small cafes in the most remote of places – perfect to stop and warm up before continuing your trek. Snowmobiling – one of the most exhilarating experiences to have in Lapland. Traversing across the snow laden countryside on a snow mobile allowing you to see wonders beyond imagination. Speed across frozen lakes, navigate through forests or take your snowmobile off piste and see what fun you can have. Snow shoe walks – walking up the side of a mountain with your guide as the stars shimmer above you in the clear northern skies. Why not take a seat on a reindeer hide and drink warm drinks around an open fire. This is the perfect opportunity to see the mysterious northern lights dance for you. Husky safaris – for those seeking something different this is an ideal excursion. Guiding your own team of huskies across the snow is both spectacular to witness as well as experience. Icelandic Pony rides – these ponies are amazing animals and in addition to walk, trot and canter – they have another gait called Tolt. These ponies are powerful and when they tolt – you are sure to be smiling. As your trek through the forest on their back, watch the snowflakes glisten like diamonds against the sunny backdrop. Ice fishing – this is an alternative experience. Watch as your guide cuts a hole in the snow and prepares your fishing line for you to cast in the hole. As you lie back on reindeer skins waiting for the fish to bite, take time to take in the breathtaking scenery and beauty which defines nature at its very best. 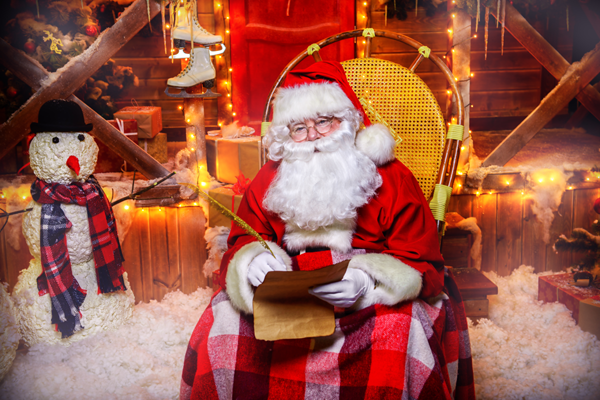 Flights leave the UK early in the morning and a full day of activities arranged including a meeting with Father Christmas and chance for the kids to personally give him their Christmas list. For adults, there is the opportunity to sample snowmobiling and husky safaris. Many trips include the warm thermal clothing that is recommended to keep warm in the very cold weather. As well as day trips, Lapland holidays and short breaks have become increasingly popular with three, four or seven night holidays now available and plenty of hotels or cabins to choose from. Our Lapland experts have firsthand knowledge of this magical destination and will be able to give you advice on all of the many trips, activities and places to stay. Call one of our experts today to arrange you a dream holiday in Lapland. Call our Lapland experts today on Freephone 0800 091 4935!